Whether it was decentralizing power in the church, easing its stance on divorce, pushing for radical action on climate change, or meeting with members of the gay community, Pope Francis is not one to stick to tradition. In another unorthodox move, the Pope has renounced the papal summer estate of Castel Gandolfo. Not unlike his decision to refuse living in the sumptuous papal apartment inside the Vatican, the Pope has given up the private residence in the countryside. He has chosen to open up the estate’s gardens to visitors, and to convert his rooms into a museum. Pope Francis has visited the property a few times but has never spent the night there. His predecessors John Paul II (1978-2005) and Benedict (2005-2013) often stayed at the estate, which has been owned by the Holy See since 1596 and has expanded over the years to include over 55 hectares (135 acres). Dramatically perched above Lake Albano, the estate is sacredly special. 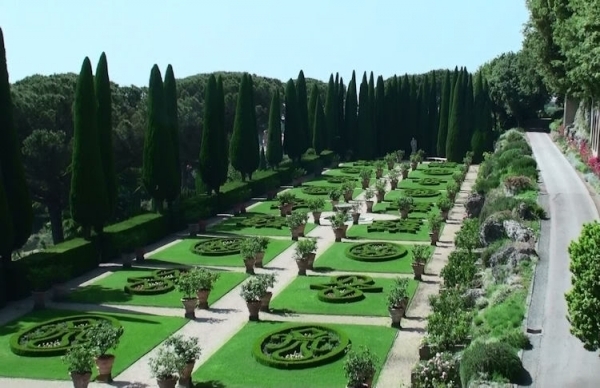 With the estate's gardens now open to the pubic, visitors can take a special white train directly from the Vatican to the countryside estate. The tour includes a visit of the Papal villa, including the past Pope’s organic farm, complete with hens, cockerels, cows and bees. For those who want to take in as much sacred material as possible, there is a cafe in the town square that makes cappuccinos with milk from the pontifical cows! Tours only take place on certain days, and are of course by reservation only. Contact your travel specialist at the Italian Concierge to help secure your place for this special visit. We suggest you visit Castel Gandolfo in conjunction with the whole Castelli Romani area. Located 25 km (15 miles) from Rome, Castel Gandolfo is part of the countryside area outside Rome, called the “Castelli Romani.” A lovely day trip to escape the crowds of Rome, this area has something for everyone- history, art, culture, religion, antiques, archeology, vineyards, and of course regional foods. Stay tuned to the Italian Concierge blog for more information on this divine day excursion.